Epp with his favorite tools – chain saw, hammer, truck. Owner Operator, Epp Wilson, enjoys building great fences. Epp has been building fences for 40 years. 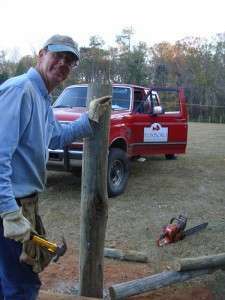 He grew up at Pine Top Farm working with his father and three brothers. They raised horses, cows and hay. His father, James Wilson, always had a project going to keep his boys busy. They learned how to do just about anything that needed doing on the farm. Epp’s father could look at a raw piece of land and envision its potential. He could see what it would look like all cleaned up and fixed up. For many years after Epp graduated from college, he and his family bought old run down farms and fixed them up and sold them. Mr. Wilson taught his sons a deep love of and respect for the land. And he taught them to see the potential in a tract of land. Epp has that ability, that gift. He comes from a long line of farmers and his father taught him well. On many projects they learned together. They embraced the challenge that each project brought. Epp enjoys sharing that talent with others. He enjoys helping people see and reach the potential on their own farms. That is why he says, “We will tackle almost anything you need done on your land.” That is simply how he was raised.